Import substitution could actuallybe benefi cial for foreign fi rmsthat already have a manufacturingpresence in Russia and areworking with Russian partners. Foreign pharmaceutical firms are looking for the bright side in Russia’s import substitution plan for the drug manufacturing sector. When in May Prime Minister Dmitry Medvedev tasked the government with creating a program of import substitution in the field of pharmaceutical production, foreign companies were worried. Although Russia’s pharmaceutical market — currently worth $19 billion a year — is a fraction of that of the U.S., which is currently valued at $377 billion according to Pharmaceutical Commerce, its loss would have been a blow to Western drug companies at a time of global economic crisis. Nevertheless, there is still cause for concern here. Today, 60 percent of the drugs on the List of Vital and Essential Medicines approved by Russian government bodies for use in public institutions are produced domestically. Under the new policy, this share should increase to 90 percent by 2018. Import substitution could actually be beneficial for foreign firms that already have a manufacturing presence in Russia and are working with Russian partners. “For localized foreigners, this is an opportunity to quickly recover the investments that they have made here,” said Victor Dmitriyev, C.E.O. of the Association of Russian Pharmaceutical Manufacturers (ARPM). Several international pharmaceutical giants, including Anglo-Swedish firm AstraZeneca, France’s Sanofi, Swiss Novartis and Danish Novo Nordisk already have production facilities in Russia. Last year, U.S. company Abbott made one of the largest transactions in the history of Russia’s pharmaceutical business by acquiring the country’s second-largest drug manufacturer, Veropharm, for 16.7 billion rubles ($495 million, at 2014 exchange rates). Abbott is still optimistic about its prospects in Russia. “We see our investment in Veropharm as an opportunity to participate in the development of the Russian pharmaceutical industry,” said Irina Gushchina, Abbott’s head of P.R. in Russia. According to Gushchina, the company plans to expand its research capabilities and further develop Veropharm’s production base in gynecology, neurology, gastroenterology and oncology, where the demand for innovative products is particularly high. Some international firms that own production facilities in Russia are wary of the government’s plans because they may require partially transferring production to a Russian partners’ facilities. But others seem ok with this prospect. Thibault Crosnier-Leconte, C.E.O. of Sanofi’s vaccine division, Sanofi Pasteur, said that the French manufacturer has plans to start production of a popular children’s vaccine at Russian company Nanolek’s factory in St. Petersburg. The plant will produce up to 10 million doses annually, fully satisfying the demand for this vaccine in Russia. “In the strategy of import substitution, we see additional opportunities for business expansion,” Crosnier-Leconte said. Sanofi Pasteur plans to start the localization process of its vaccine production next year with the transfer of know-how for production technology and quality control systems. The whole process should be complete by 2019. Germany’s Bayer is also moving forward working with local partners. “Bayer is pursuing its localization strategy through selective partnerships with Russian producers focused on full-cycle production,” said Niels Hessmann, Bayer’s C.E.O. in Russia. In 2012, Bayer entered into a partnership with Russian manufacturer Medsintez. 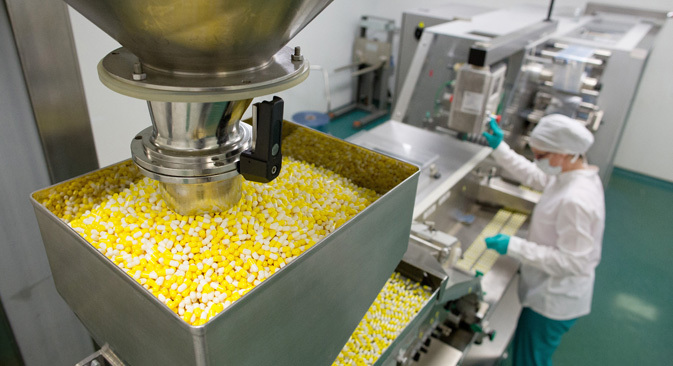 In 2015, the first commercial batch of the antibiotic Avelox was produced at Medsintez laboratories. Russia’s pharmaceutical market is divided into two segments: the private sector (commercial companies and individuals) — worth $11.2 billion — and the public sector (state hospitals, clinics) — worth $4.9 billion, according to calculations by DSM Group. The state budget is used to purchase drugs for state-owned clinics and pharmacies where low-income citizens with chronic diseases receive medicines for free or at discounted prices. Drugs for these clinics must be purchased from the state-approved List of Vital and Essential Medicines.